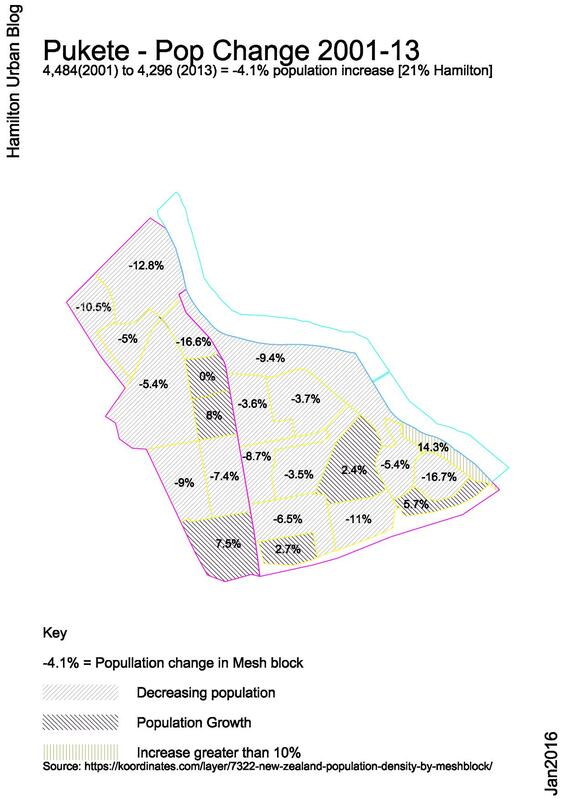 Growth and investment in Pukete may have reached the limit of what Hamilton’s district plan encourages; only 6 mesh block areas show population growth. Sixteen show falls in population, and one shows zero change. 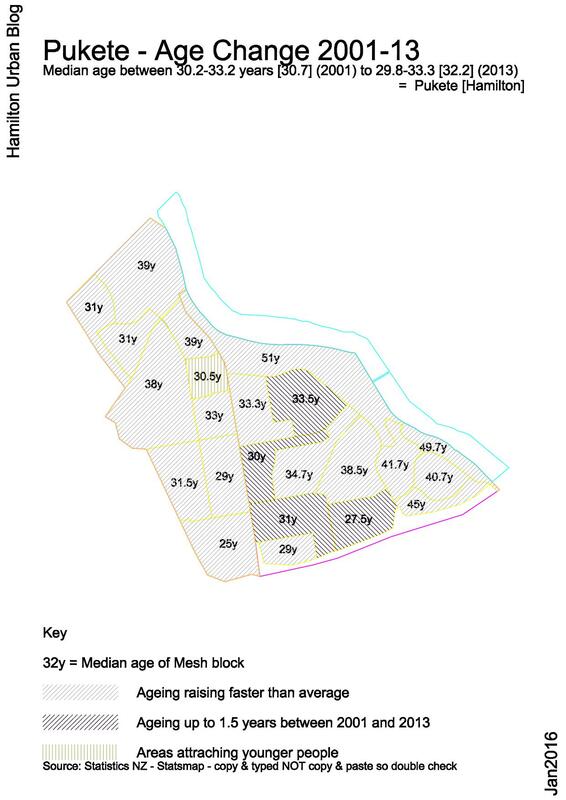 With respect to changes in age, only one mesh block has attracted younger people. 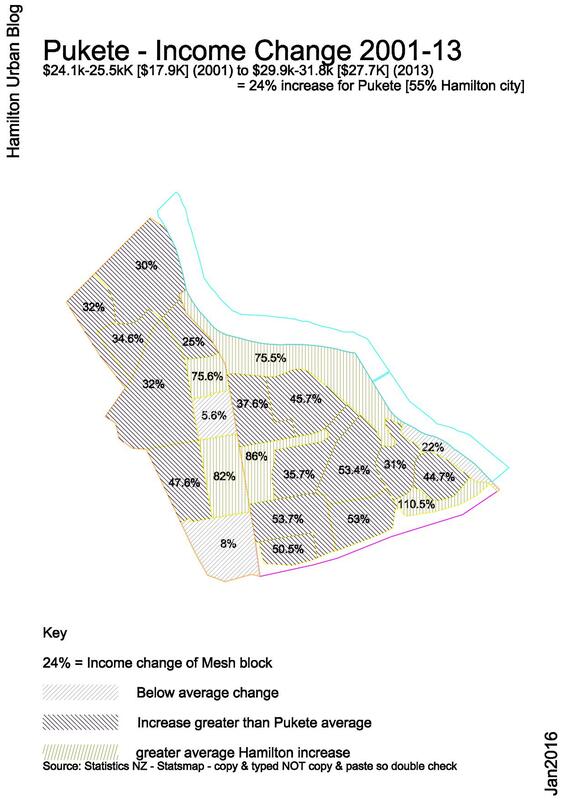 A minority of blocks are ageing at a similar rate to Hamilton city as a whole, but most are ageing more rapidly. A trend of the same type is happening with change in income; there are a small number of income earners that are doing well, but many do not appear to be getting the income increases most Hamilton workers are getting. Looking at the NZ Statistic Map census data with regard to changes in numbers of households, we find zero change in the number of households in the area between Pukete Rd and Wairere Drive this century (675 in 2001 – 675 in 2013). In Pukete west only 15 new households have been added this century (801 in 2001 – 816 in 2013). Even with this small change in the number of households there are roughly 200 fewer people living here. Put another way, there is infrastructure that could support 65 or more households, which is being under-used. The question of change has been put to the council as part of the proposed district plan submissions, by the Property Council New Zealand. For a lay person it doesn’t seem hard to analyse the “impact on the city’s infrastructure,” knowing the area’s infrastructure was put in place to support more people than are using it now. So the infrastructure was put in place relatively recently to cope with more housing. How does size of section and infrastructure compare to that of, say, University àrea, built in the ’60’s, that is now medium/high density and being developed in places such as Vesty Ave with 1/4 acre sections now holding new 4x duplex housing units? And how does Pukete infrastructure compare with that of say, Fairview Downs, built in (was it ’70’s?) which is about to be increased by Chedworth Properties under the Ruakura Structure Plan with a sizeable block of new housing of a similar density? What consideration has been given to the effect on 3 waters, given that population is being at least quadrupled in University area; or on roading, new and old, given that at times both areas are currently gridlocked from personal experience! Pukete has water reservoir, plus on its northern boundary there is the cities waste water plant, should not be hard for council to measure impact on 3 waters. So if we what to manage the effect of city grid lock, it is properly sensible to have people living in places close to mixed areas, like Pukete which is close to schools, retail and employment. The idea of moving to smaller section size like 350 m2, allowing new investment (replace one dwell with two), without making step change in housing type that a high density area does (replace one dwelling with 4+). My original comment asked for a comparison between what appears to be sound planning at Pukete and what is happening to areas, such as Silverdale and Fairview Downs established in 1960s, which are now subject to multi-unit development infill, and increasing housing estates using the same old infrastructure, ie. roads, water, stormwater and sewerage, with apparently few additional facilities. In other words, how will this infill impact on roads and 3 waters in these areas without additional infrastructure. If there is additional infrastructure planned for this increased population, what is it? How does it stack up against the expansion in Pukete? Yes, sound sense to move to Pukete! For 1960s city infrastructure, Library has this: Hamilton City “Its Establishment and Development”, by L.G. Westwood, March 1962. Started with Wairere Drive extension, Hillcrest round about, soon more Wairere drive extension, then Hamilton bypass, rebuilds Ruakura Rd and Newstead round about. This is big money, over Two Billion Dollars. Do you think it will make a difference? “How does it stack up against the expansion in Pukete?” Nearly all the Wairere traffic ends up in at Pukete/Wairere intersection. Outcome: grid lock for anyone in a motor vehicle.